Your warehouse is a Jack of all trades. It serves as a storage facility, first and foremost, but it is also a shipping depot, a manufacturing facility, and even office space. This is why effective warehouse design is so important. You need to maximize your available space. And one of the most cost-effective ways to accomplish this is via Modular Offices. When it comes to altering the layout of your warehouse, adding offices, cleanrooms, or partitioning you have two options: modular construction or stick-built construction. The latter can be extremely time consuming – hello, downtime! – and expensive, while modular construction offers a much more economical way to add space and usability to a warehouse. Modular offices are pre-built modules that fit together to form the perfect, custom office space for your warehouse. What Are the Benefits of Modular Offices? As your business grows, your needs change. Modular offices offer you a fully-customizable and easily adaptable way to add the office space you need. Modular construction allows you the ability to add to, relocate, and reuse any and all parts. The wall systems are designed so that any panel can be removed, replaced, or changed almost effortlessly, allowing your office space to grow right along with your business. Time is money, as they say. You simply cannot afford downtime, which is one of the primary reasons full-blown remodeling is out of the question. You need a solution that gets the job done without stopping you from getting your job done. 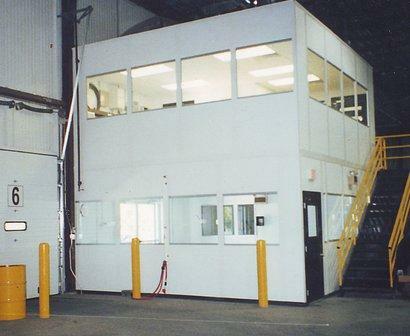 Modular office components install cleaner, faster, and easier than traditional offices, meaning less downtime and a smaller impact for your operation. S.W. Betz. has been providing businesses in Maryland and beyond with all of their essential Weighing, Material Handling, Dock, and Warehouse equipment since 1933. If you want to learn more about Modular Offices, please contact S.W. Betz by calling 410-574-1414 or 800-332-0322 today! You can count on the S.W. Betz Company to work with you and provide you with our extensive knowledge of the industry. This entry was posted on Tuesday, September 15th, 2015 at 6:21 pm. Both comments and pings are currently closed.